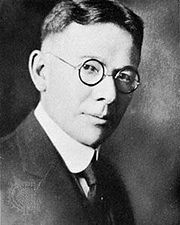 Lewis Madison Terman (January 15, 1877 – December 21, 1956) was an American psychologist and author. He was noted as a pioneer in educational psychology in the early 20th century at the Stanford Graduate School of Education. He is best known for his revision of the Stanford–Binet Intelligence Scales and for initiating the longitudinal study of children with high IQs called the Genetic Studies of Genius. He was a prominent eugenicist and was a member of the Human Betterment Foundation. He also served as president of the American Psychological Association. A Review of General Psychology survey, published in 2002, ranked Terman as the 72nd most cited psychologist of the 20th century, in a tie with G. Stanley Hall. Terman was born in Indianapolis, Indiana, the son of Martha P. (Cutsinger) and James William Terman. He received a BS, BPd (Bachelor of Pedagogy), and BA from Central Normal College in 1894 and 1898, and a BA and MA from the Indiana University Bloomington in 1903. He received his PhD from Clark University in 1905. He worked as a school principal in San Bernardino, California in 1905, and as a professor at Los Angeles Normal School in 1907. In 1910, he joined the faculty of Stanford University as a professor of educational psychology at the invitation of Ellwood Patterson Cubberley and remained associated with the university until his death. He served as chairman of the psychology department from 1922 to 1945. His son, Frederick Terman, is widely credited (together with William Shockley) with being the father of Silicon Valley. Terman published the Stanford Revision of the Binet-Simon Scale in 1916 and revisions were released in 1937 and 1960. Original work on the test had been completed by Alfred Binet and Théodore Simon of France. Terman promoted his test – the "Stanford-Binet" – as an aid for the classification of developmentally disabled children. Early on, Terman adopted William Stern's suggestion that mental age/chronological age times 100 be made the intelligence quotient or IQ. Later revisions adopted the Wechsler cohort-norming of IQ. The first mass administration of IQ testing was done with 1.7 million soldiers during World War I, when Terman served in a psychological testing role with the United States military. Terman was able to work with other applied psychologists to categorize army recruits. The recruits were given group intelligence tests which took about an hour to administer. Testing options included Army Alpha, a text-based test, and Army Beta, a picture-based test for nonreaders. 25% could not complete the Alpha test. The examiners scored the tests on a scale ranging from "A" through "E". Recruits who earned scores of "A" would be trained as officers while those who earned scores of "D" and "E" would never receive officer training. The work of psychologists during the war proved to Americans that intelligence tests could have broader utility. After the war Terman and his colleagues pressed for intelligence tests to be used in schools to improve the efficiency of growing American schools. Terman followed J. McKeen Cattell's work which combined the ideas of Wilhelm Wundt and Francis Galton saying that those who are intellectually superior will have better "sensory acuity, strength of grip, sensitivity to pain, and memory for dictated consonants". At Clark University, Terman wrote his doctoral dissertation entitled Genius and stupidity: a study of some of the intellectual processes of seven "bright" and seven "stupid" boys. He administered Cattell's tests on boys who were considered intelligent versus boys who were considered unintelligent. Unlike Binet and Simon, whose goal was to identify less able school children in order to aid them with the needed care required, Terman proposed using IQ tests to classify children and put them on the appropriate job-track. He believed IQ was inherited and was the strongest predictor of one's ultimate success in life. Terman's study of genius and gifted children was a lifelong interest. His fascination with the intelligence of children began early in his career since he was familiar with Alfred Binet's research in this area. Through his studies on gifted children, Terman hoped first, to discover the best educational settings for gifted children and, second, to test and dispel the negative stereotypes that gifted children were "conceited, freakish, socially eccentric, and [insane]". Previously, the research had looked at genius adults had been retrospective, examining their early years for clues to the development of talent. With Binet's development of IQ tests, it became possible to quickly identify gifted children and study them from their early childhood into adulthood. In his 1922 paper called A New Approach to the Study of Genius, Terman noted that this advancement in testing marked a change in research on geniuses and giftedness. Throughout his life Terman developed several methods for examining individuals with high ability, such as the longitudinal method and above-level testing. Some of these procedures would be adopted by other social scientists studying very different populations. Terman found his answers in his longitudinal study on gifted children: Genetic Studies of Genius. Initiated in 1921, the Genetic Studies of Genius was from the outset a long-term study of gifted children. Published in five volumes, Terman followed children with extremely high IQ in childhood throughout their lives. The fifth volume examined the children in a 35-year follow-up, and looked at the gifted group during mid-life. Genetic Studies of Genius revealed that gifted and genius children were in at least as good as average health and had normal personalities. Few of them demonstrated the previously-held negative stereotypes of gifted children. He found that gifted children did not fit the existing stereotypes often associated with them: they were not weak and sickly social misfits, but in fact were generally taller, in better health, better developed physically, and better adapted socially than other children. The children included in his studies were colloquially referred to as "Termites". The gifted children thrived both socially and academically. In relationships, they were less likely to divorce. Additionally, those in the gifted group were generally successful in their careers: Many received awards recognizing their achievements. Though many of the children reached exceptional heights in adulthood, not all did. Terman explored the causes of obvious talent not being realized, exploring personal obstacles, education, and lack of opportunity as causes. Terman found that high childhood IQ was correlated with many great adult achievements. Participants in his Genetic Studies of Genius had adult socioeconomic and educational outcomes that were greater than what would be expected based solely on their childhood socioeconomic status. Terman died before he completed the fifth volume of Genetic Studies of Genius, but Melita Oden, a colleague, completed the volume and published it. Terman wished for the study to continue on after his death, so he selected Robert Richardson Sears, one of the many successful participants in the study as well as a colleague of his, to continue with the work. The study is still supported by Stanford University and will continue until the last of the "Termites" withdraws from the study or dies. In 1915, he wrote a paper called The mental hygiene of exceptional children. He pointed out that though he believed the capacity for intelligence is inherited, those with exceptional intelligence also need exceptional schooling. Terman wrote that "[bright children] are rarely given tasks which call forth their best ability, and as a result they run the risk of falling into lifelong habits of submaximum efficiency". In other words, nature (heredity) plays a large role in determining intelligence, but nurture (the environment) is also important in fostering the innate intellectual ability. By his own admission, there was nothing in his own ancestry that would have led anyone to predict him to have an intellectual career. From 1957 until 2018, Terman and his son had a middle school named after them. In 2018, the school board of the Palo Alto Unified School District unanimously decided to rename the school in honor of former Palo Alto City Councilwoman Ellen Fletcher after Terman's involvement with the eugenics movement came to the attention of parents and the school board. His son Frederick Terman, as provost of Stanford University, greatly expanded the science, statistics and engineering departments that helped catapult Stanford into the ranks of the world's first class educational institutions, as well as spurring the growth of Silicon Valley. Stanford University has an endowed professorship in his honor. Terman came to believe that IQ was, in addition to dependent on education, highly heritable. High-grade or border-line deficiency... is very, very common among Spanish-Indian and Mexican families of the Southwest and also among negroes. Their dullness seems to be racial, or at least inherent in the family stocks from which they come... Children of this group should be segregated into separate classes... They cannot master abstractions but they can often be made into efficient workers... from a eugenic point of view they constitute a grave problem because of their unusually prolific breeding (The Measurement of Intelligence, 1916, p. 91-92). Terman's work in addition to other openly eugenic psychologists and education scholars such as E. Thorndike, Leta Hollingworth, Charles Brigham, and H. H. Goddard contributed to long standing policies and practices of racial school segregation. In this same book, Terman further stated that eugenics was important in the study of intelligence because “considering the tremendous cost of vice and crime…it is evident that psychological testing has found here one of its richest applications” (p. 12). He further insisted that human “dullness... seems to be racial, or at least inherent in the family” and found with “extraordinary frequency among Indians, Mexicans, and negroes” (p. 91). The suggestions of a significant role for genetics in IQ led Terman to later join the Human Betterment Foundation, a Pasadena-based eugenics group founded by E. S. Gosney in 1928 which had as part of its agenda the promotion and enforcement of compulsory sterilization laws in California. Stern et al. (2017) documented significant long-standing violence inflicted on those identified by eugenicists as unfit and sterilized. Frequently promoted for all eugenic scientists such as Lewis Terman is the notion that he was a man of his less-than-enlightened time. On the other hand, this argument is an excuse used by those who wish to protect and defend sciences and scientists producing racist, xenophobic, and oppressive ideological work. Eugenics and its influences on psychology sciences (see Pioneer Fund sciences and studies) unquestioned in society. Terman's work led to long-standing profound social inequalities such as racial school segregation. Eugenics became openly questioned in relation to Nazi eugenic policies of segregation, sterilization, and racial purity campaigns that led to the Holocaust (See Robert Jay Lifton's work on Nazi doctors). Indeed, during the Nuremberg trials Nazi scientists and doctors claimed the same immunity of following their cultural and scientific requirements in their work. Terman not only believed in but advocated for eugenics, and his research project was called "Genetic Studies of Genius." He openly assumed that high IQ kids (nearly all white) would become the future leaders of science, industry, and politics. His inclusion of girls was an important exception to the biases of the era, since women had only just gotten the right to vote, and had few career options. Nevertheless, Terman never contradicted other eugenic writers who insisted that women were "mothers of the race," whose education and intellectual work must focus primarily on their role as breeders (see Popenoe & Johnson's key text Applied Eugenics). Terman's work was openly criticized by his contemporaries such as the progressive journalist Walter Lippmann. Lippman published numerous exposes on Terman's and other eugenic work questioning the absurdities produced by eugenicists in the name of sciences, including Terman's claim that the majority of American orphans carried parasitic germo-plasms that made most orphans be classified as eugenically unfit. Contemporary versions of psychology history minimize this history, including with statements that Terman, like his other eugenic contemporaries (H. H. Goddard, Robert Yerkes, Charles Davenport), were merely "men of their times." Terman is often claimed to be "above all a scientist"; and he was dedicated to collecting meaningful data, and to accepting what the data showed even when it contradicted his beliefs. Notably, because eugenics claims to be "science of racial or human betterment," supposedly exclusively based on sciences, the argument that his work merely focused on data rather than eugenic ideology, remains central to support of ideologically-based sciences. Specifically, eugenic-influenced, or race sciences such as "race realism," have been supported by the Pioneer Fund and used to promote continued claims that sciences have proved that differences in intelligence among varied groups as based on biological genetic heritability (e.g., works by Linda Gottfredson, Herrnstein & Murray's the Bell Curve, Richard Lynn, J. Phillip Rushton, and other scientists). These eugenic-based sciences are central to race arguments promoted by White supremacy organizations such as the American Renaissance or in White Supremacy publications such as David Duke's My Awakening. Terman's work on intelligence testing, which emphasized that racial differences were signs of evolutionary level of fitness as well as that his experiments on orphans, especially twin orphans, determined biological genetic hereditary origins of intelligence, remains foundational for contemporary arguments of "race realism" and behavioral genetic studies on supposedly biological, hereditary, and universal racial and gender differences. Terman, L.M. (1915). The mental hygiene of exceptional children. Pedagogical Seminary, 22529-537. Terman, L.M. (1922). A new approach to the study of genius. Psychological Review, 29(4), 310-318. Terman, L.M. (Ed.). (1959). The gifted group at mid-life. Stanford, CA: Stanford University Press. ^ Boring, Edwin Garrigues (1959). "Lewis Madison Terman, 1877-1956: A Biographical Memoire by Edwin G. Boring". Stanford University Press. ^ "Palo Alto History Project". Archived from the original on 2010-01-16. ^ "Terman, Lewis Madison - Infoplease.com". Retrieved 8 October 2014. ^ Terman, L.M. (1906). Genius and stupidity: a study of some of the intellectual processes of seven 'bright' and seven 'stupid' boys. Pedagogical Seminary, 13, 307-373. ^ a b c d Bernreuter, R. G., Miles, C.C., Tinker, M.A., & Young, K. (1942). Studies in personality. New York, NY: McGraw-Hill Book Company. ^ Shurkin, Joel (1992). Terman's Kids: The Groundbreaking Study of How the Gifted Grow Up. Boston (MA): Little, Brown. ISBN 978-0-316-78890-8. Lay summary (28 June 2010). ^ Terman, L.M. (1932). Autobiography. In C. Murchison (Ed. ), A history of psychology, Vol.II (pp. 297-332). Worcester, MA; Clark University Press. ^ Kadvany, Elena (March 28, 2018). "School board votes to rename schools after Frank Greene, Ellen Fletcher: Divisive, years long debate ends with final decision Tuesday night". Palo Alto Weekly. ^ Kelly, Kevin (March 28, 2018). "Palo Alto: Middle schools to be named after Frank Greene Jr., Ellen Fletcher: Terman Middle School will be renamed in honor of Ellen Fletcher, Jordan Middle will be renamed after Frank Greene Jr., putting end to controversy". San Jose Mercury News. ^ Ashoke, Sohini & Lee, Amanda (March 31, 2017). "Board cuts eugenicist ties with vote to rename schools". Gunn Oracle. ^ "Psychological Predictors of Long Life". Looking in the Cultural Mirror. psychologytoday.com. June 5, 2012. Minton, H.L. (1988). Lewis M. Terman: pioneer in psychology testing. New York, NY: New York University Press. Vialle, W. (1994). 'Termanal' science? The work of Lewis Terman revisited. Roeper Review, 17(1), 32-38. Autobiography of Lewis M. Terman. First published in Murchison, Carl. (Ed.) (1930). History of Psychology in Autobiography (Vol. 2, pp. 297–331). Republished by the permission of Clark University Press, Worcester, MA. Lippman, W. (1922). The Mental Age of Americans. New Republic, 32 (412-417), 213–215, 246–248, 275–277, 297–298, 328–330, 9–11. Lewis M. Terman, “The Great Conspiracy or the Impulse Imperious of Intelligence Testers, Psychoanalyzed and Exposed by Mr. Lippmann,” New Republic 33 (December 27, 1922): 116–120. "Psychological Predictors of Long Life: An 80-year study discovers traits that help people to live longer". Psychology Today. June 5, 2012.